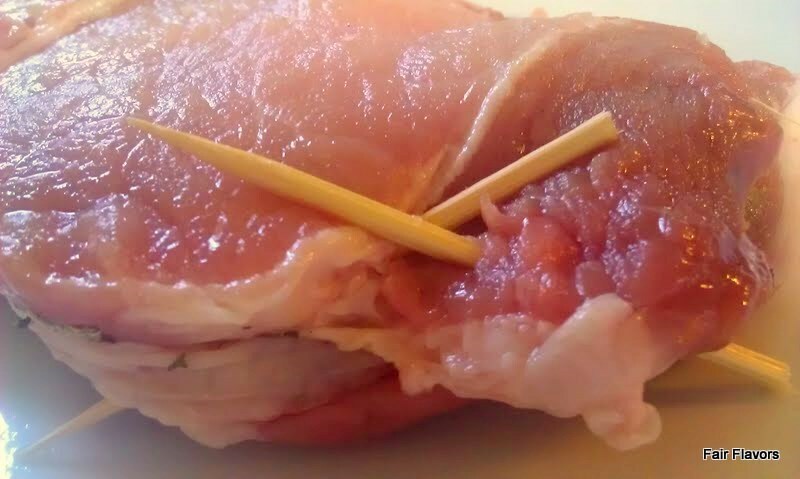 A few years ago, I thought pork chops were a boring cut of meat. That was a time when the only pork chops I knew, were the tiny, ready marinated chunks of meat our supermarkets sell. They were too salty and whatever I tried, however I baked or fried them, the always seem to be tough, salty and just plain nasty. A few months ago my butcher had some huge organic chops on sale and they looked quite different from what I was used to, so I gave it a try and it completely changed my mind about pork chops! 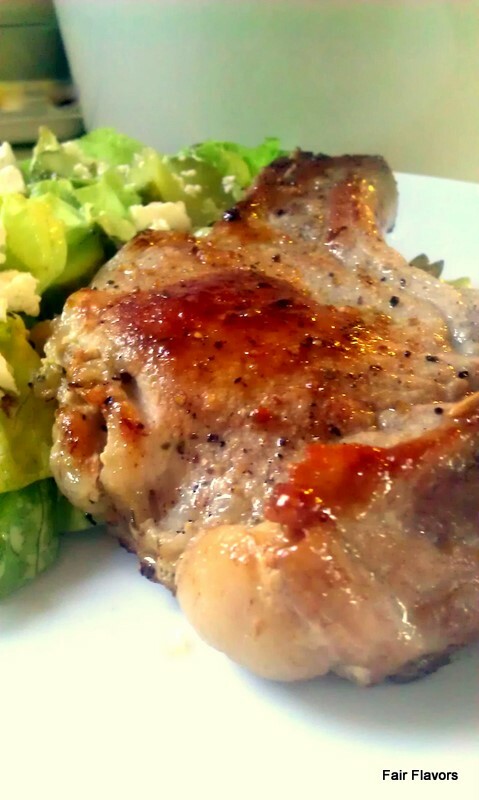 This recipe is a surprise version of the plain chop. It's easy to make and uses only a few ingredients. They are stuffed with mustard, herbs and brie. You can't really see that they're stuffed, but once you cut them open, there's that lovely melted brie, which tastes so good with the mustard. 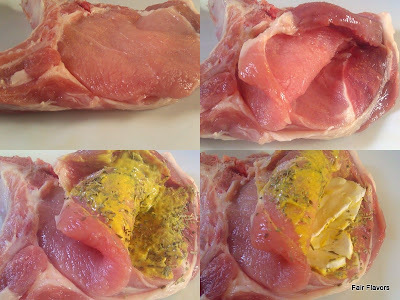 With a very sharp knife, cut halfway throug the meat, all the way to the bone. Carefully start cutting sideways. Be really careful not to pierce through the sides. You want to create a pocket for the filling. This is the hard part, but with a little patience it can be done. I did fine on my first try, so I believe you will too. Next, rub a teaspoon of mustard in each pocket. Sprinkle the herbs on top of it, about a teaspoon in each pocket. Then stuff the brie inside, about half an oz. per chop. Don't let it hang outside, or you'll get a terrible mess of melted cheese while baking. And finally, to keep the filling neatly packed inside, close them up with two skewers or toothpicks. Sprinkle a little salt and pepper on top, and they're ready for cooking. Heat some fat in a frying pan and sear the meat on high heat for a minute on both sides. Turn the heat back to low and let slowly cook for about 20 minutes. Turn every now and then. Take the skewers or toothpicks out, put them on a plate, a big salad on the side and presto: a lovely dinner! Wow, this looks awesome, Anna. Can't wait to try it.